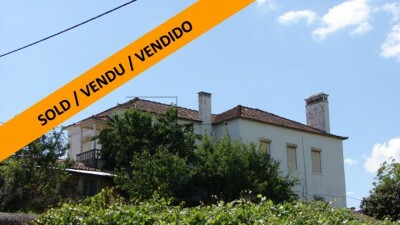 A seven bedroom detached manor house with private garden for sale near Ferreira do Zêzere, central Portugal. The manor house, which is connected to both mains water and electricity is in a relatively good state of repair and is ideal for someone looking to create a bed and breakfast style establishment. The manor house, which is set over two floors, has wooden framed windows and exterior doors. The main entrance to the house leads into an entrance hallway, off which there is a wooden faced staircase providing access to the first floor accommodation. The entrance hallway, which has a tiled floor and partially tiled, traditional style tiled walls, provides access to a secondary hallway, which in turn gives access to the property’s kitchen. The kitchen is basic but functional. The kitchen has partially tiled walls, a traditional, large fireplace to one corner complete with stone mantel piece. There are some built in base level units within the kitchen, which also has internal wooden shutters. Adjacent to the kitchen there is a partially tiled bathroom. The bathroom has a bath with shower above, toilet, bidet and pedestal sink as well as plumbing for a washing machine. There is a small bedroom to the ground floor, which has a tiled floor and wooden ceiling. The living room is spacious and has a tiled floor and traditional style, partially tiled walls. There is a central stone fireplace and two double opening exterior access doors which lead to the front of the property. Off the living room there is a second bathroom. This bathroom is fully tiled and has a toilet, shower and pedestal basin. The staircase leading to the first floor accommodation opens out onto a centralised hallway, which runs the length of the manor house. Off this hallway, which has a wooden floor, there are six bedrooms. All of the bedrooms have wooden floors and one of the bedrooms is double aspect. One of the bedrooms also has a wooden staircase which provides access to a large attic space with another have a set of part glazed patio doors which open out onto a Juliet balcony. There is a bathroom to the first floor, which is partially tiled. The bathroom has a bath with shower above, toilet, bidet and pedestal sink. At the end of the hallway there is a study room, which has a wooden floor. The study room is double aspect and has a double opening exterior access door which leads to an exterior tone staircase at the side of the manor house. The attic, accessed via a wooden staircase in one of the bedrooms, is currently used for storage purposes. The attic does have a wooden floor and beamed roof and could be converted into additional living space quite easily. The property has a walled garden to the side and rear with a vehicle access gate providing off street parking. The walled garden has several single storey storage buildings, one of which has a traditional style bread oven and barbecue. The garden is relatively flat and there are a number of mature fruit and nut trees in situ as well as a large palm tree. The property has a well for irrigation purposes and there is a single garage at the side of the manor house for parking. The manor house is situated in the small village of Frazoeira in central Portugal. Frazoeira has several cafes and a small mini-market as well as a pharmacy. The larger town of Ferreira do Zêzere, which is around five to 10 minutes drive away has supermarkets, shops, banks, health centre, school, pharmacies, restaurants, library and bus station. Castelo do Bode lake, which is popular for all kinds of water sport activities is just a short drive form the manor house and the historic village of Dornes, where it is possible to hire canoes and kayaks is also just a short drive away. The historic town of Tomar, which is home to the UNESCO listed Convento do Cristo, is around 25 minutes drive from the property. Tomar is a popular and bustling town with a variety of restaurants, cafes, bars, historic monuments, schools, university, bus and train station and hospital. The closest airport to the property is located at Lisbon, which is around one and three quarter hours’ by car. Lisbon airport is serviced by a variety of low cost airlines, which operate regular flights into and out of the United Kingdom and other European countries.